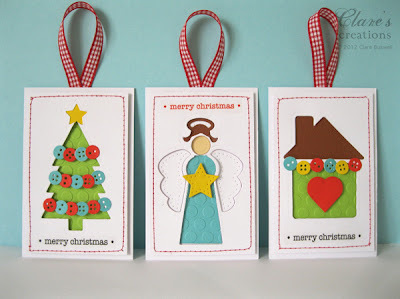 Welcome to the monthly NinaB Designs team blog hop. For this month's hop, Nina challenged the team to create an ornament or tags, which will come in handy in the upcoming holidays. I made some CAS Christmas tags! I decided to play with some negative die-cutting and paper-piecing techniques for my tags. I used the tree and star dies from Spellbinders Sweet Folk Art to create the negative space, propped up with some foam tape, I backed the tree with some embossed green card (Seeing spots) and some yellow card behind the star. 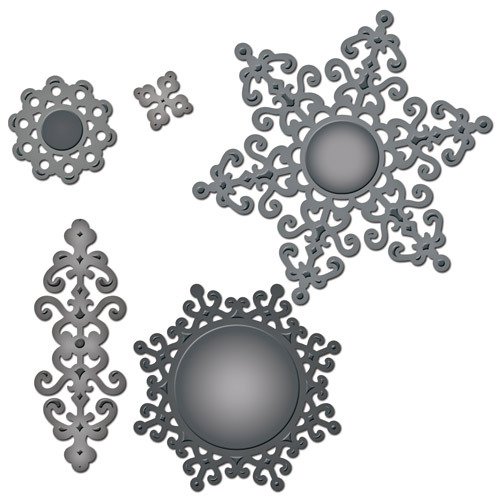 To create the simple garland decorations for the tree I die-cut the small buttons from Spellbinders Sewing Elements. I adhered these together before adding to my tag. The sentiment stickers I used on all the tags are from We've Got Your Sticker - Merry from SRM Stickers. For the angel tag, I taped the various die elements in place from Spellbinders Sweet Folk Art to create the negative space, then I die cut the pieces in different colored cardstock to paper piece the angel. The angel die is definitely my favorite in this set. For my final tag, I used the little house die from Spellbinders Home Sweet Home and used the same techniques as my previous tags. To make my little house more festive I added a string of colored lights in the form of buttons from Spellbinders Sewing Elements. The gingham ribbon is from Craft Fairy. Here are the products I used for my tags. Everybody is welcome to comment and be eligible to win. The winners will be announced on October 22 on Nina's Blog, where you will also find all the relevant info regarding the giveaways. Thank you for joining us today! These are darling! Love how you cuttlebugged the inside and added the embellishments. What great ideas for those tags! Thanks for sharing, they are awesome! Very cute--I like the negative die cuts and the colors and buttons. Oh, these are fabulous! 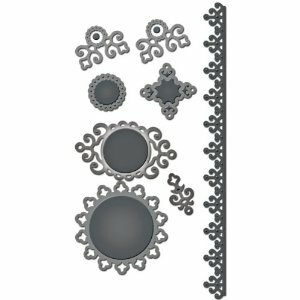 Such a simple design lets those dies really shine. WOW these are adorable I love the layered/peek-a-boo effect! BRILLIANT! Oh my GOODNESS! Those are the cutest tags EVER!!! 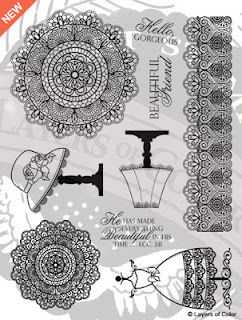 Love the embossed layer behind the negative shapes. LOVE all the buttons. Such sweet tags! I love your colorful and very effective use of the buttons! Those are super cute. I love you "button" decorations. I do not think I could pick a favorite. These are really sweet tags!! Love the fun colors and peekaboo cuts!! Super cute! Love the dimension you have them. 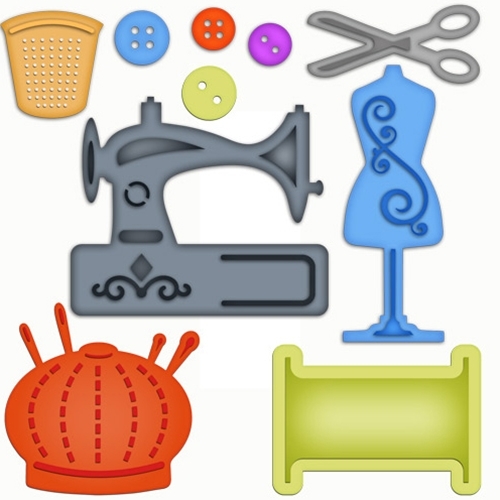 Love the cute tags, especially the button decorations. OMGosh these are so adorable, love all three of them and the cute design and details. I not only love how you used the negative image but also how you created even more detail by embossing the paper underneath! love the embossed papers, they really pop! Wonderful tags. Love the bright colors and the embossed spaces. Great ideas. Thanks for the inspiration! 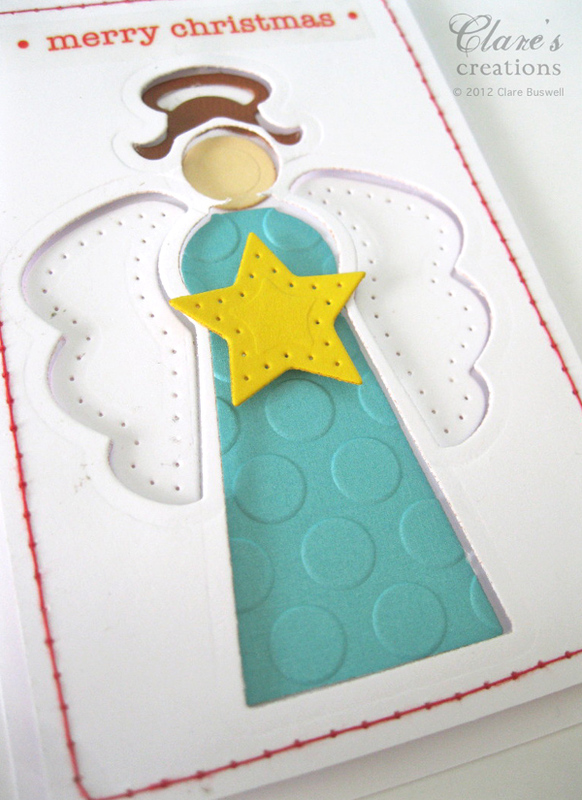 The embossed cardstock looks great behind the negative diecut spaces! Adorable tags. Love the embossing, button garland, paper piercing and bright happy colors. Great job. Wow, Clare - what sweet projects! I don't think I can choose a favorite :) Thanks for sharing! These are so cute! I love the bright colors! The little buttons are so cute! I never think to use the negative, but you have definetly inspired me! Thanks for sharing such cute ideas! Nice creations, very bright, beautiful and playful. Love the negative die cut spaces! Very cute! Love the negative die cut space! Very cute! These are the cutest! I love the bright happy colors and dies you picked! Beautiful tags! I love your colors and the stitched edges! i love how you mixed and matched all of the stuff. so cute. love to see neg space used too. What sweet tags. 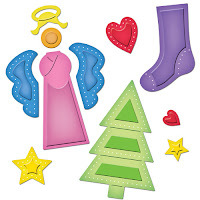 Love the angel! The buttons are a great complement to the design. Nice job! Wow, you blew me away with these tags, Clare. I love the use of both positive and negative cuts. And that garland or ribbons, just brilliant. Thank you! Loving these tags...so colorful and pretty...and what a great idea to use the negatives...I would never of thought to do that!! I love the colors. I also love how all the tags coordinate. So pretty! What cute tags - bright and happy colors that make me smile. I love the little angel holding the star. I just love your focal "windows"! The button garland on the tree card is perfect! Claire, what fun you had making these tags. I love the use of the negative die cut. I have a ton of them! Always saving them, thinking they will be useful, some day. LOL I love all of your tags, but especially the tree. Thanks for a chance to win these great dies or stamps. Hi Clare! 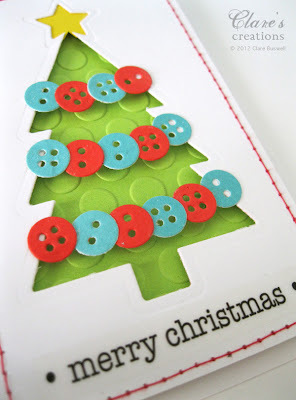 I love these tags, especially I am drawn to the tree with the button trims, so fun! I love the use of the negative die cuts. I have a ton of these! Always thinking there will be a use for them... LOL Thanks for your wonderful holiday inspirations and a chance to win these great prized. OH! I love these tags, the buttons, and felt, and the hand sewn effect, with positive and negative. just adorable. love them all....thanks for sharing. I love di e cut button garland. These are really cute.I love the negatives and the button dies are awesome. Thanks for the chance to win. What cute little Christmas tags! Love the colors and all the buttons! So cute tags. Loving the on with angel on it. Such a darling. Wow, are these cute? They almost look like illustrations for something. Beautiful! 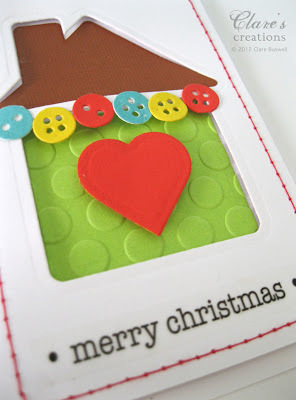 LOVE the way you used the negative die cut shapes and those adorable little button die cuts!! Fun and festive! Love this design set --so many possibilities! Super cute tags! Beautifully done! OH, you just couldn't get much cuter than this! 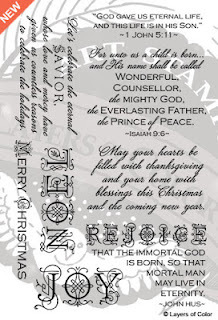 Gorgeous CAS christmas tags, Clare! Love the combo of white and those bright colors. Those tags are so coool, those cute buttons! I love this hop and finding new blogs, and the prizes are amazing too! Oh my gosh, are you serious? These tags are so cool, I love how you die cut them but then layered the back to coordinate. And the little buttons............. I don't know what to say, these are adorable!